In the ever-evolving political paradigms there prevail both historical and modern era commerce and trade entities; and, within this survival atmosphere both traditional and modern era ethics and agendas move forward - similar to the 1613 Two Row Wampum (TRW) - Gus Wen Tah (GWT) - Peace, Trust and Harmony(PTH) Treaty between the indigenous Original Peoples of the Great Turtle Islands North and South; that, today, are named North and South America. It is worthy to consider these TRW / GWT / PTH protocols (referred to hereafter as the Sacred Covenants), after 400 years, still have significant bearing in the social contracts that develop governance, ethos and hope. The Great Turtle Island Federation - which is registered at the United Nations in New York as an IGO / Inter-Governmental Organization - as seen below, is an worthy template through which to examine how custom and traditional evolve in this polico quagmire. 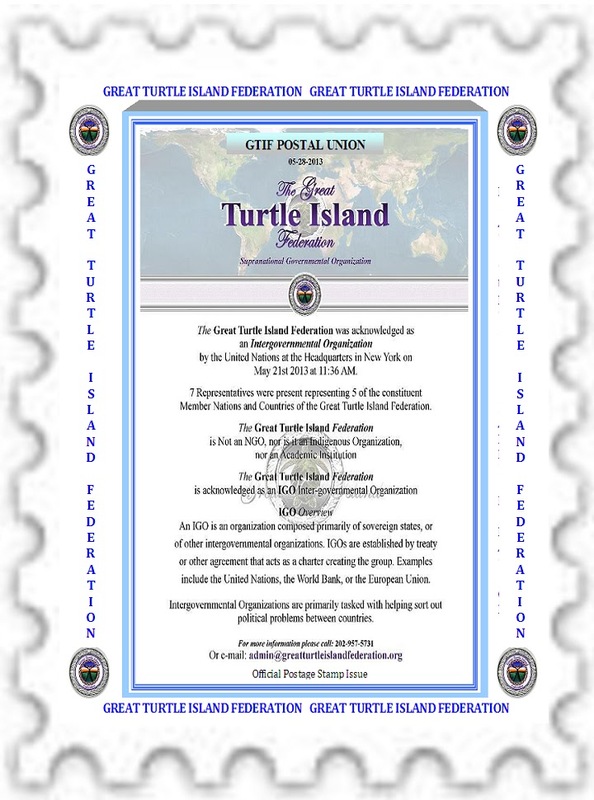 This document is under consideration by the GTI Postal Union Executive Board to be the first postage stamp / currency of the Great Turtle Island Federation. The Union of International Associations / UIA publishes lists of IGOs. While the UIA publications also includes The Encyclopedia of World Problems And Human Potential. Copyrighted : 2018 : INCgSTT : Capital Formations : HRH Kwa'mutsun Nation State SINCE TIME BEGAN. Awesome Inc. theme. Powered by Blogger.